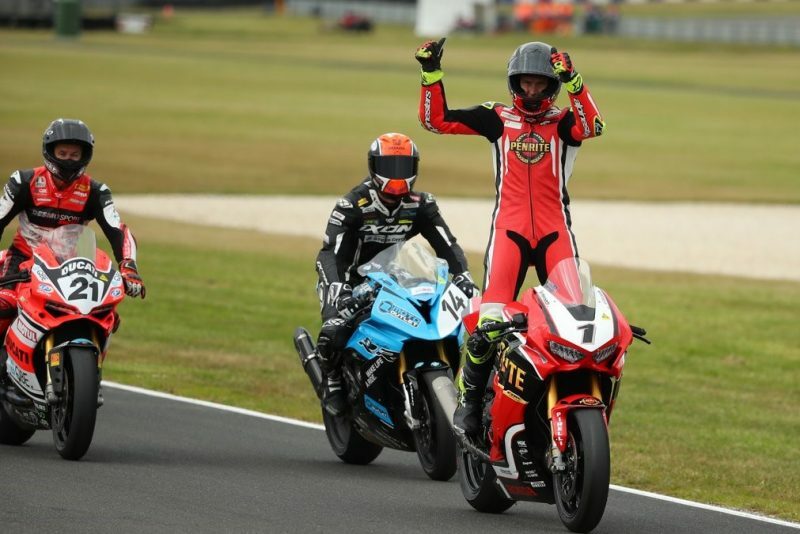 A bold double-pass has given Troy Herfoss victory over Troy Bayliss and Glenn Allerton in the final Superbikes support race at the Michelin Australian Motorcycle Grand Prix. Herfoss (Honda) was third at the start of the final lap but got under Allerton (BMW) at Doohan Corner and carried the speed out to Southern Loop to also go down the inside of Bayliss (Ducati). The runaway trio then came up on thick traffic at the Turn 4 Hairpin and Siberia through which Herfoss grabbed a small buffer as Bayliss lost another position to Allerton. While the 2018 ASBK champion was relatively safe out in front as they tore down Gardner Straight for the final time, Allerton and Bayliss were separated by virtually nothing at the finish line. Timing initially gave Allerton second position by just a thousandth but positions were soon reversed on video review. Herfoss’ win makes for three different victors in as many races in the exhibition round, which was taken out overall by Bayliss, and each spent time leading Race 3. Mark Chiodo (Suzuki) jumped into the lead at the start of the eight-lap race, when Bayliss briefly dropped to fifth, but was quickly reeled in by the aforementioned three and finished a distant fourth. In Supersport 300, Seth Crump (KTM) won Race 1 from 10th on the grid. Oli Bayliss (Kawasaki) beat Hunter Ford (Yamaha) to take Race 2 by 0.092s, in which the top seven was covered by 0.789s at the chequered flag.